Lucia is a Sicilian saint, who died a martyr’s death in 304. 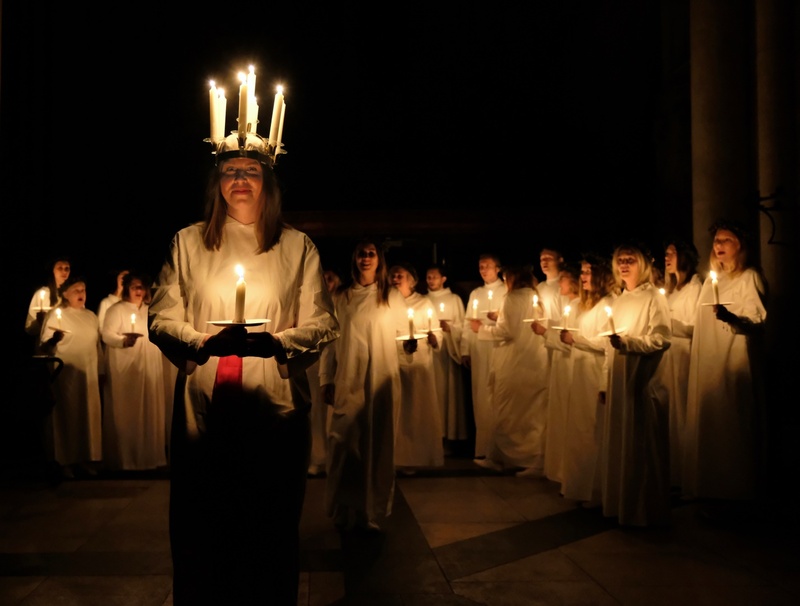 In the medieval calendar, her day, 13th December, coincided with the shortest day of the year, and Lucia (Latin lux = light) became the symbolic bringer of light in the dark North. 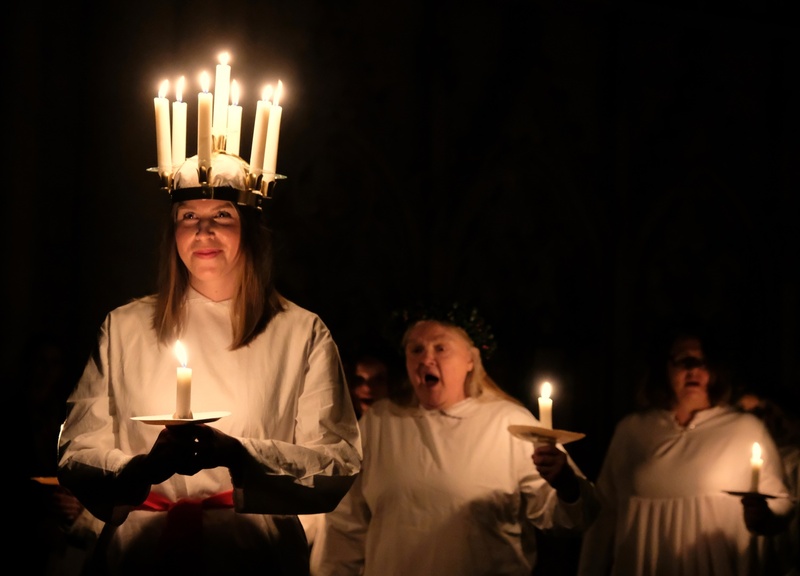 In the farming community, her day also marked the beginning of preparations for Christmas – slaughter, sausage-making, baking, candle-making, etc. 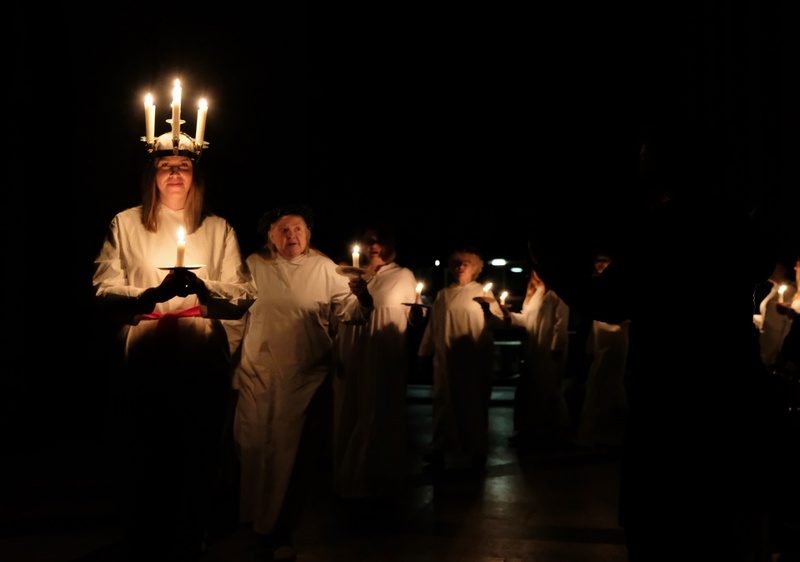 – and so, even after the Reformation, unlike most of the other saints, Lucia was not forgotten. 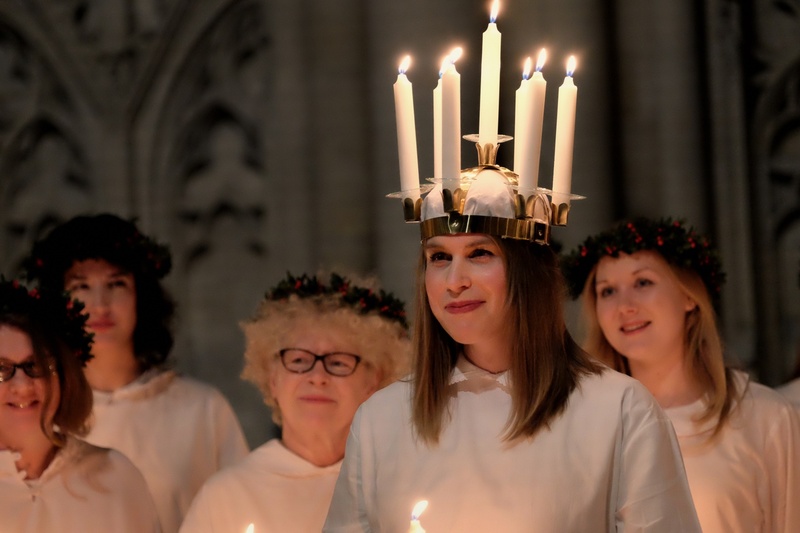 The idea of a crown of candles probably came from protestant Germany, where the catholic St Nicholas was replaced by the Christkind, the Christ-child, as the bringer of gifts. 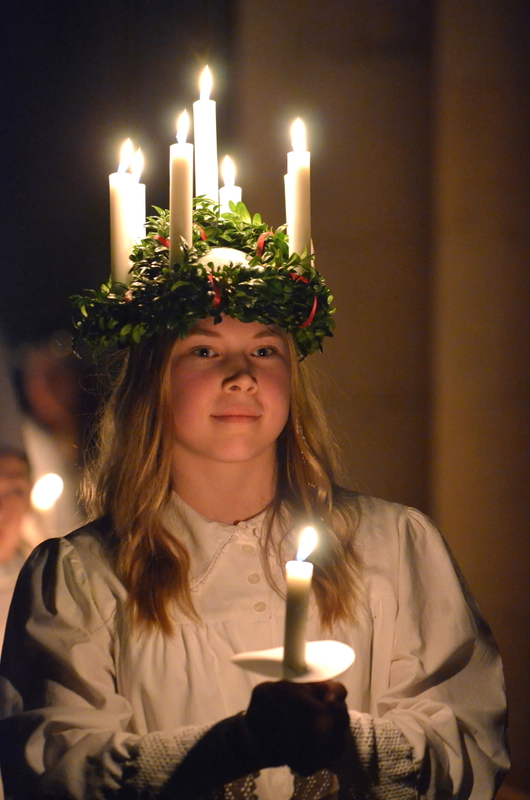 The Christkind was often represented by a young girl with a crown of candles, perhaps to indicate a halo. 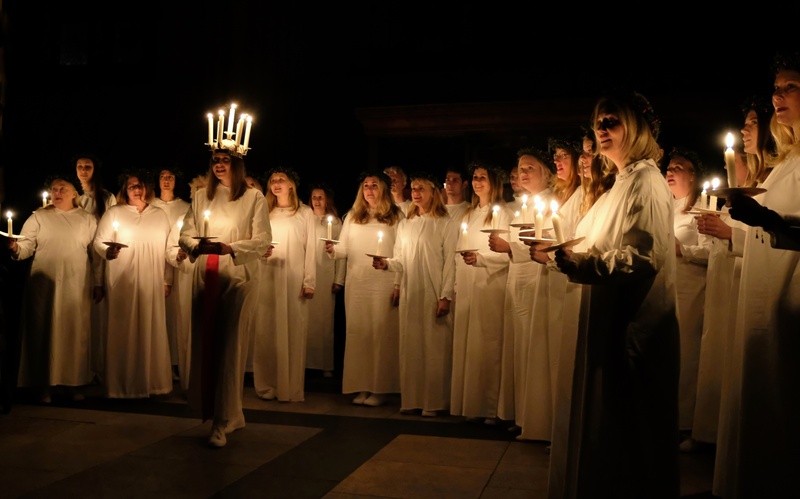 The earliest record of Lucia celebrations, as we now know them, in a Swedish home dates from 1764: “Just as I was enjoying my best sleep, vocal music could be heard outside my door, which woke me up. 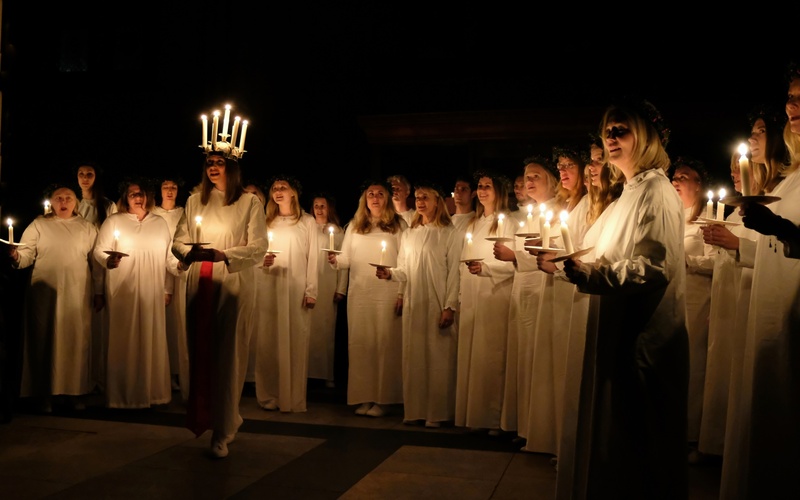 A white-clad woman entered…” Today, on Lucia morning, in practically every Swedish home and in every school, office, club and hotel, Lucia and her attendants bring coffee and Lucia buns, and sing their song. 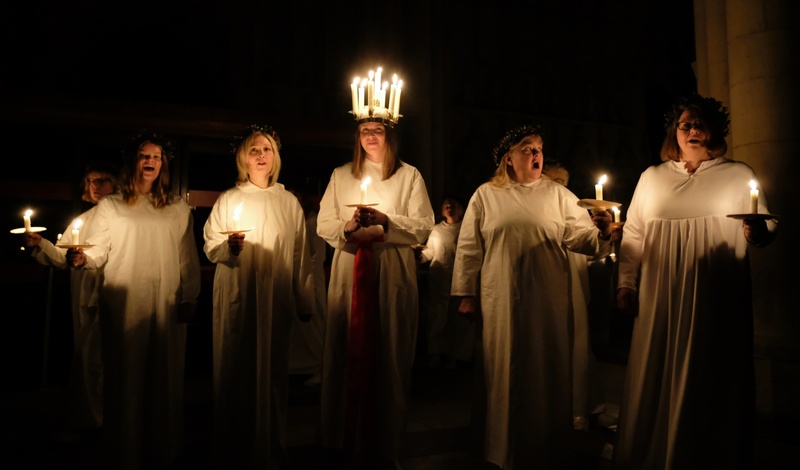 York Anglo-Scandinavian Society has included a Lucia procession in their Christmas party since the 1970’s. 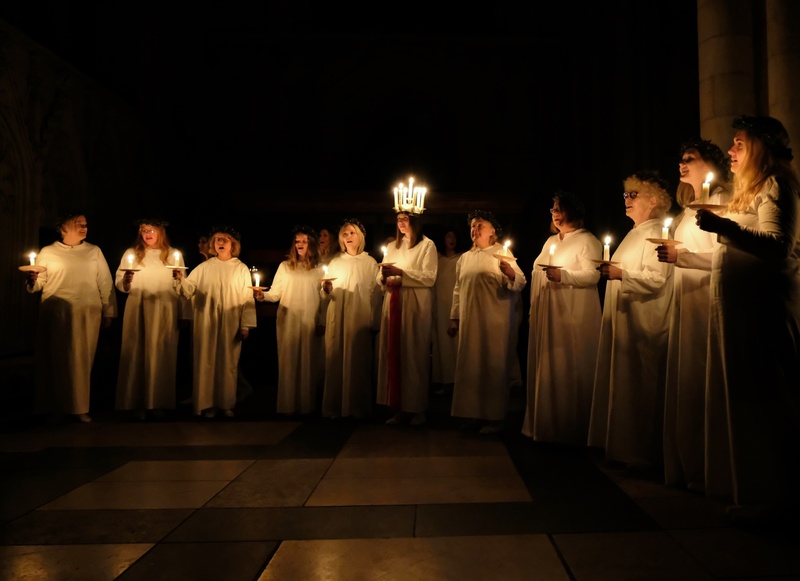 In 2013, for the first time, there was a “Sankta Lucia, Festival of Light” service in York Minster, which was attended by over 700 people. 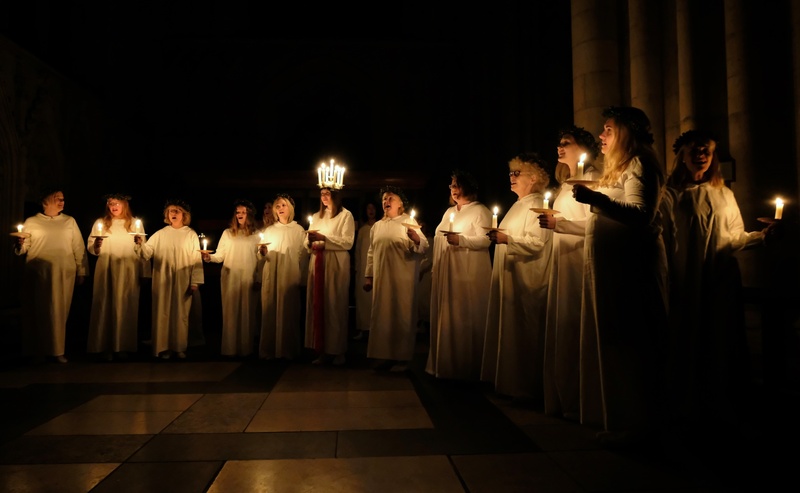 There have been four further such celebrations in York Minster attended by a larger number of people each time – the attendance for 2017 reached over 1,200 ! 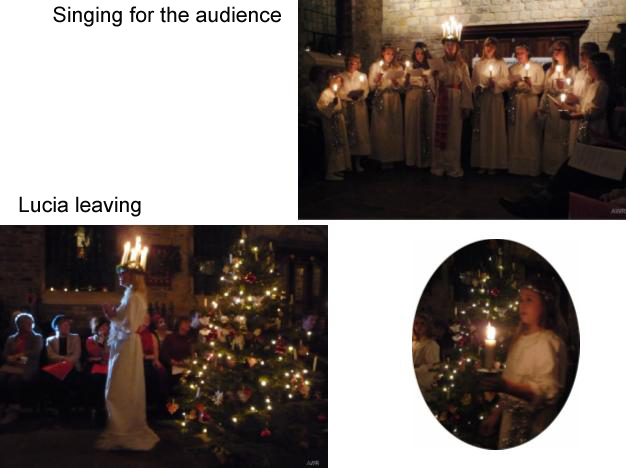 Lucia with her maidens singing for the audience. 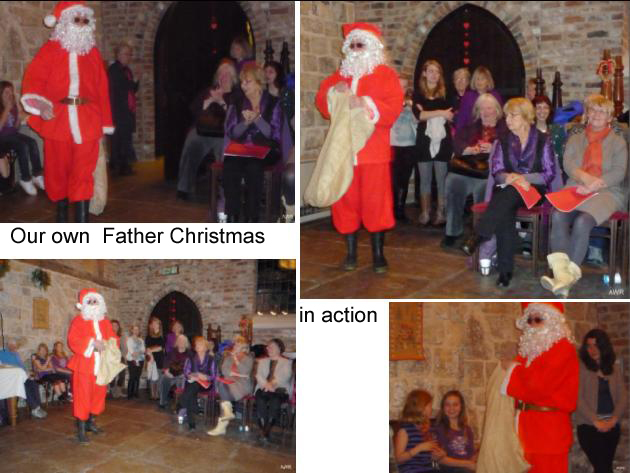 We also had one ‘star boy’ in the procession. 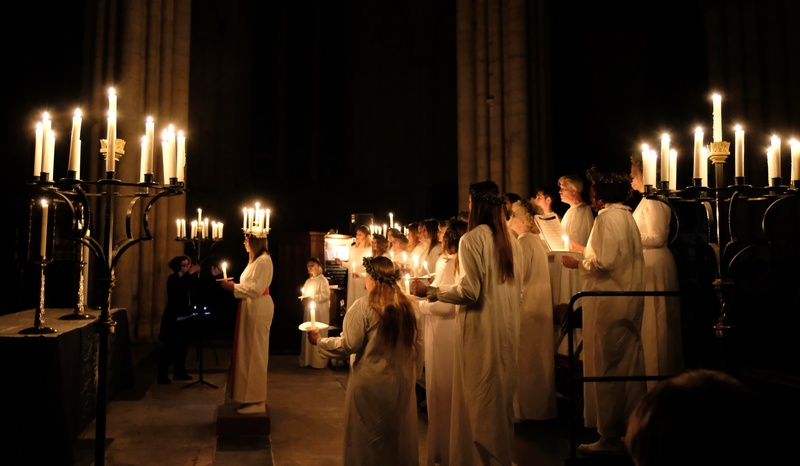 We were delighted that the fifth Sankta Lucia in York Minster was attended by 1,200 people. 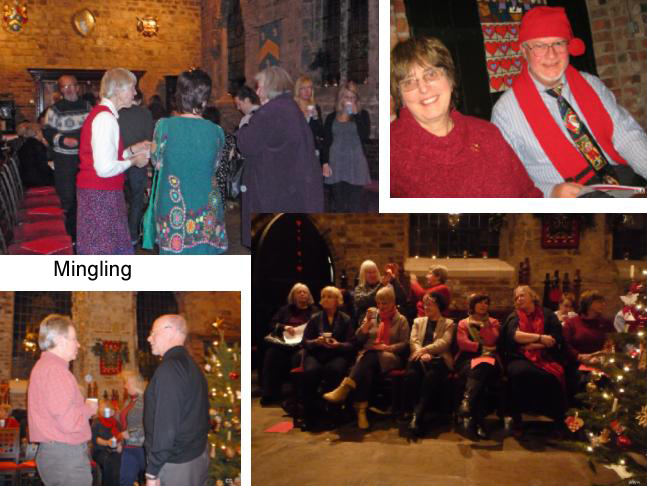 We are most grateful to the following for the success of this service: Peter Moger (Precentor, York Minster), The London Nordic Choir (www.londonnordicchoir.com) and their director, Carina Einarson, soprano soloist, Mia Karlsson, Robert Sharpe (Director Music, York Minster who played the splendid Minster organ), our readers: Dr Brita Green (sometime Chair of YASS), Johan Berglund (Counsellor, Embassy of Sweden in London) and The Ven Dr Malcolm Grundy (Chair of YASS) and our sponsors the Embassy of Sweden, Carlbom Shipping Ltd, the Anglo-Swedish Society, IKEA and Senior Architectural Systems. The photographs below are shown with the permission of the Chapter of York and were taken by Barry Male (www.alternativeoccasions.com), a professional photographer, who was our official photographer for the service.